The NFL’s quarterback carousel went for quite the wild ride this offseason. During every NFL offseason, tons of players switch teams and 2018 has been no different. Especially when it comes to quarterbacks. With the trades and signings in free agency so far this year, there is a possibility that at least seven teams around the league could have a brand new starting quarterback for next season. Based on some additional moves that the Jets have made since their signing of Bridgewater was reported, his time in New York could end before the regular season even begins. In a trade with the Indianapolis Colts last week, New York acquired the third overall selection in this year’s NFL Draft. Word around the street is that pick will be used to draft a quarterback. If that does end up happening, then the Jets quarterback room will consist of Bridgewater, Josh McCown, and a first-round rookie. Considering New York only guaranteed $1 million to Bridgewater in his one-year deal with the team, it’s very possible that the Jets may not be the only franchise the young quarterback plays for in 2018. Every year, NFL teams try and convince themselves that a career backup is capable of becoming a solid starter for their offense. Most of the time, however, it doesn’t really work out that way. This will likely be the case for McCarron in Buffalo. The guy could not even beat out Andy Dalton for the Cincinnati Bengals starting job. Yet everyone is supposed to believe that McCarron is somehow going to blossom into the next Dan Marino? It’s possible that the Bills could open the regular season with McCarron as their starter. But if he turns in a few bad games to begin the year, Buffalo fans will be begging (likely in a shouting manner) for someone else to start under center. Somehow, someway, Bradford and his glass knees continue to convince teams that he’s worth spending at least $15 million per season on. This year’s victim is none other than the Cardinals. In a world where there was no such thing as injuries, Bradford would have been a great addition for Arizona. But Bradford’s injury history is reality. The veteran quarterback has missed a total of 42 games since 2013 because of them. Perhaps the Cardinals can actually find a way to keep Bradford healthy enough to stay on the field for a full season. But until he proves otherwise, Arizona giving him $15 million fully guaranteed this year was not a very bright move. Last season was a magical one for Keenum. He unexpectedly helped lead the Minnesota Vikings to the NFC Championship and it ultimately resulted in him cashing in with the Broncos this offseason. Denver sounds happy that Keenum is their guy, but are they investing too much into a quarterback who has only had one successful season since entering the NFL six years ago? With the Vikings, Keenum wasn’t relied on to be a game-breaker for their offense. Thanks to a good rushing attack and solid pass protection, the veteran quarterback was able to take advantage of play-action calls and the luxury having two of the best receivers in the league, Adam Thielen and Stefon Diggs, to throw to. Keenum will still have two talented pass-catchers in Denver in Demaryius Thomas and Emmanuel Sanders, but he won’t have even close to the pass protection he had in Minnesota. The lack of protection could lead to the Broncos getting the older, more unstable version of Keenum and not the guy who showed up in 2017 for the Vikings. During his three seasons with the Buffalo Bills, Taylor proved that he is more than capable of being a starter in the NFL. His play in 2017 helped the Bills reach the playoffs for the first time in 17 seasons. Since 2015, Taylor has completed 62.6 percent of his passes for 8,857 yards (201 per game), 51 touchdowns, and just 16 interceptions. He also ran for 1,575 yards and 14 touchdowns in that same time period. Has Taylor reached his ceiling as an NFL quarterback or was he held back by Buffalo’s offensive schemes? Andy Dalton had his best season as a pro when Hue Jackson was the offensive coordinator for the Cincinnati Bengals in 2015. It’s quite possible that the same could be in line for Taylor next season in Cleveland with Jackson as his head coach. After finally figuring out how to be a solid NFL quarterback in 2011 with the San Francisco 49ers, Smith has since been one of the league’s most under-appreciated signal callers. With him as their quarterback, the Kansas City Chiefs averaged 10 wins for the past five seasons. During the five years before Smith became their starting quarterback, the Chiefs averaged just five victories per season. Smith being ranked second on this list does not necessarily mean that he’s a guaranteed Pro Bowler in 2018. But the Redskins actually made a pretty smart move by trading for the veteran quarterback knowing that Kirk Cousins would not be returning next season. With Washington, Smith likely won’t put up any crazy passing numbers. However, the Redskins should not have to worry about finding production from under center for at least a couple of seasons. 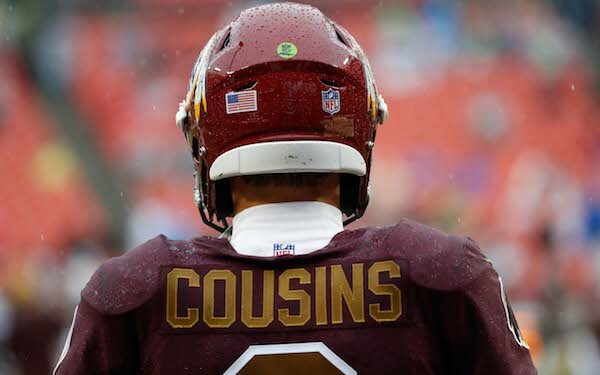 Believe it or not, Cousins actually chose wins over money when he decided to sign with the Vikings instead of the New York Jets. Of course, the quarterback is still getting a monster truckload of cash from Minnesota ($84 million fully guaranteed), but he reportedly could have received even more from the Jets. With the Vikings, Cousins does not have to put the entire offense on his back like he did during his time with the Redskins. Minnesota head coach Mike Zimmer likes offenses that emphasize the run in order to increase the rest time for his defense, so it’s likely that the Vikings’ offensive game plans will not center entirely around the quarterback next season. When he does get to throw, Cousins will have some talented targets to get the ball to, including Stefon Diggs, Adam Thielen, Kyle Rudolph, and Dalvin Cook. The quarterback did not have that kind of talent in 2017 with Washington when he still managed to throw for 4,093 yards and 27 touchdowns. Cousins may not be the piece that automatically guarantees Minnesota will win the Super Bowl for the next three years. But with him under center, the Vikings should at least be among those contending for a championship on a consistent basis.